Last Tuesday night, five stories above the blustery city streets of San Francisco, apartment #506 was filled with friends and music and an obscene amount of melted cheese. 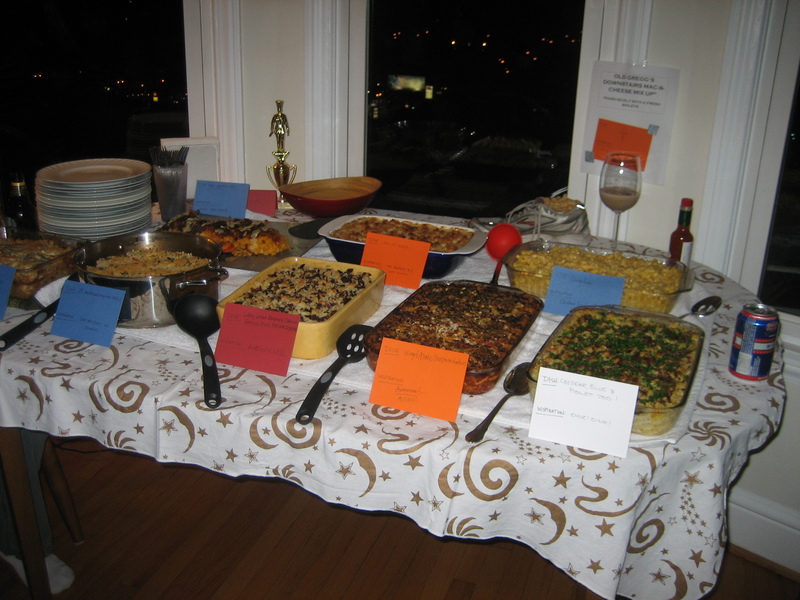 We had gathered there celebrate Caleb’s birthday with the Inaugural Mac ‘n Cheese Challenge. 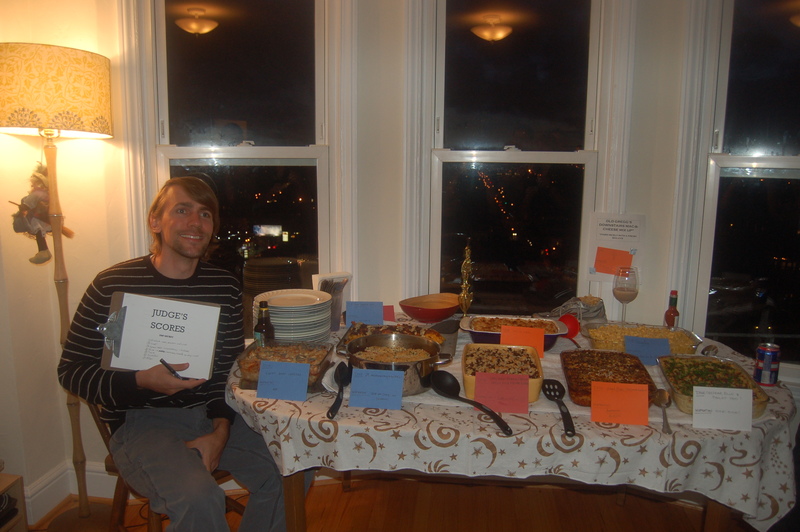 Per Ellie’s instructions, we brought our mac and cheese masterpieces for Caleb to judge and later, for all to devour. Judge: Caleb, the Birthday Boy. You must name your creation. One mac entry per household. 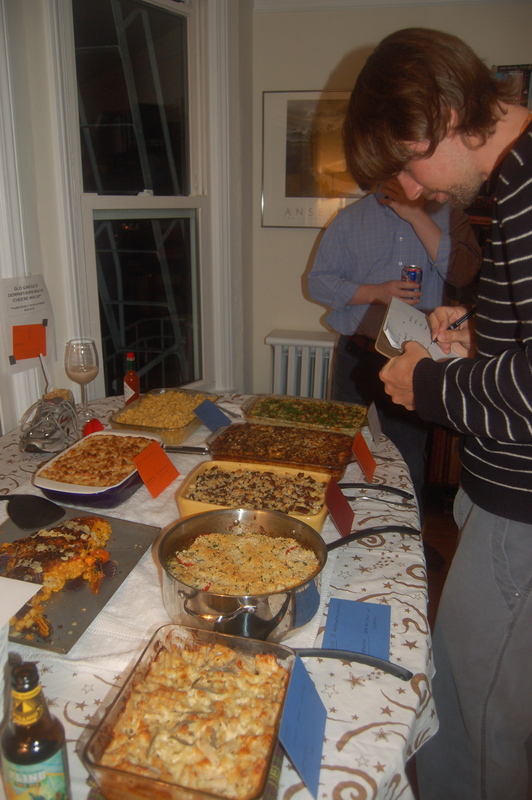 Bring a handwritten version of the recipe for the birthday boy. To eliminate any bias, we will not tell Caleb who is behind each creation until after the judging period has ended. Heating and Re-Heating – the hotter the dish when you arrive the better. Full disclosure: I’d never made homemade mac ‘n cheese before. Not once. I guess if I’m going to cook pasta, I’m not inclined to add a stick of butter, a quart of milk and 3 pounds of cheese to the pot. I like to keep things simple and fresh and on the lighter side. But, mac and cheese was Caleb’s birthday gift. I didn’t want to mess it up. Plus, I knew that Ellie had ordered a trophy for the overall winner. And, who doesn’t love a trophy? 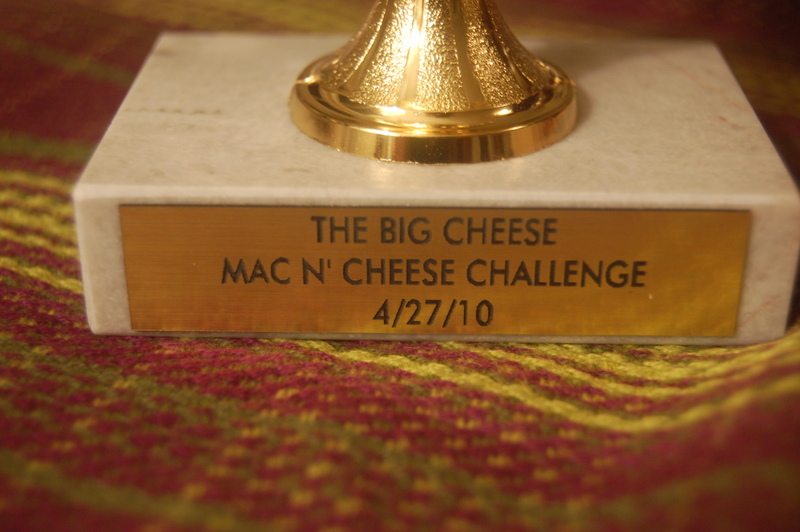 Particularly one that reads, “The Big Cheese.” So, I was in it to win it. I knew the competition was steep. Whit and Dave would be there. Individually they have impeccable taste. Collectively they have the most refined palate on the planet. Adam and his architecturally inclined mind would be there too. He could win big points in the “appearance” and “creativity” categories. Drass and Jeff could pull through with rumors of a secret family recipe that involved copious amounts of Velveeta and butter. 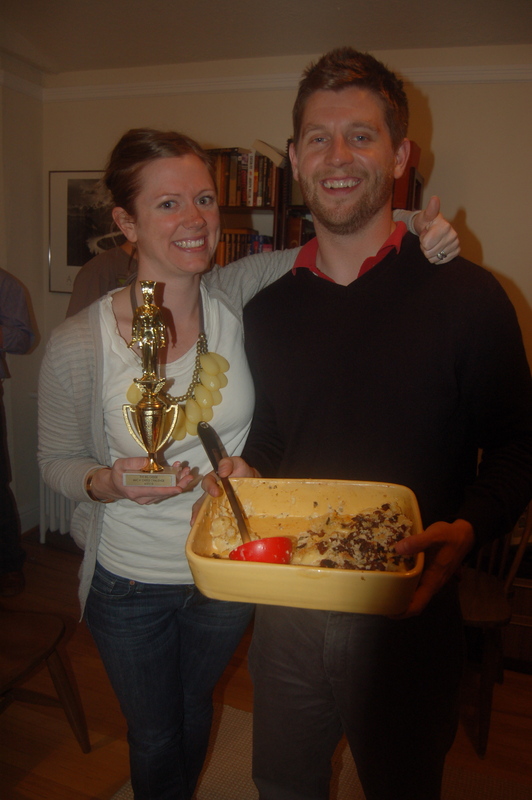 I conducted a late night Google search for “mac and cheese winners” on Monday night. Yes, the challenge was less than 24 hours away. I was getting a much later start than I’d planned. (Whenohwhen will I come to accept that I’m a procrastinator down to my very core? Time will always one step ahead of me.) 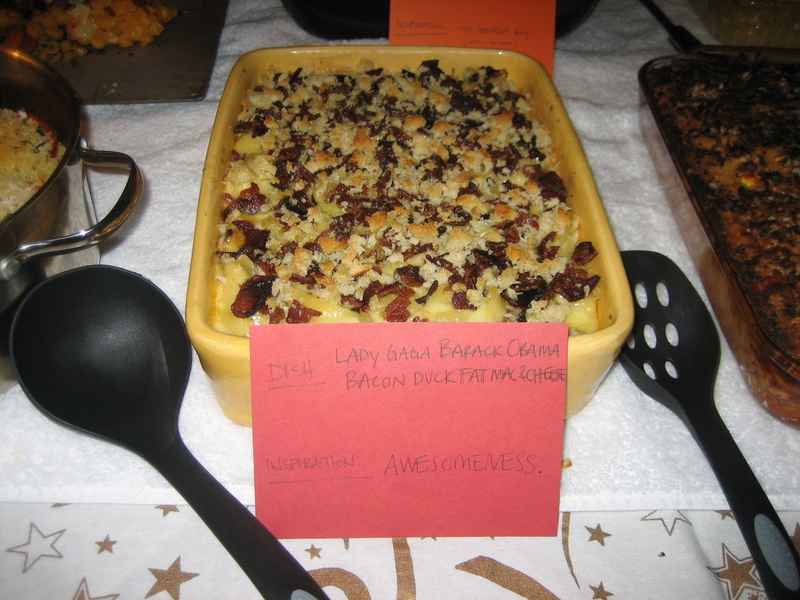 I found two promising recipes from two homemadekitchengoddesses – Martha Stewart and Ina Garten. I ended up combining elements from both recipes – freshly sliced tomatoes on top from Ina and the Gruyere plus Pecorino combo tip from Martha. My mac turned out nicely, all things considered. It however, tasted runofthemill rinkydink, compared to some of the competition. Nope, I did not win. I didn’t even come close. Happelsauce: What was your inspiration? Kate and Alden: Trying to please the crowd. We just went with the most popular things we could think of. H: Do you consider yourselves mac and cheese connoisseurs? K&A: Oh, definitely. More cheese connoisseurs than macaroni though. 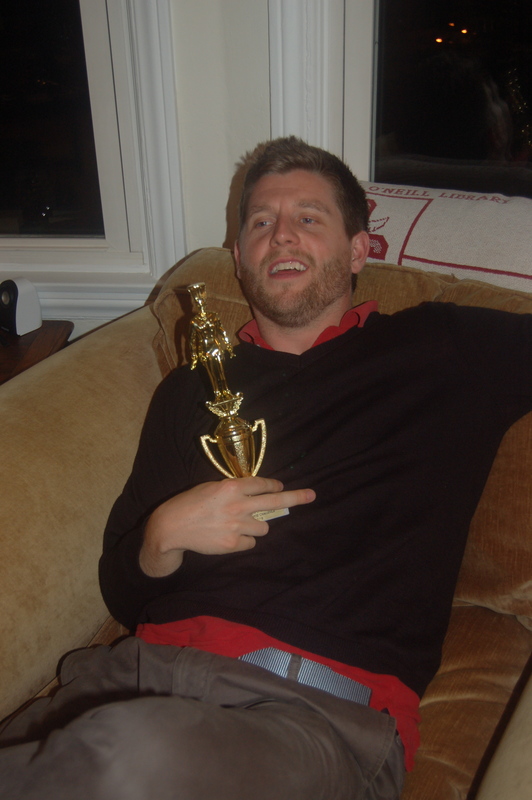 H: Before judging began, what did you think your chances were of taking home the trophy? K&A: Between Kate’s cooking skills and Alden’s heckling skills, we figured we had a decent chance of impressing people on the one hand and making our competition look bad on the other. H: Where is the trophy now? K&A: It’s on our trophy shelf with the other trophies, obviously. H: Do you have any insider tips to making delish mac and cheese? What’s your secret? K&A: Butter. Fat. Spiciness. Crunchiness. Using lots of words in the name that people like. And medium sized shells were the perfect pasta vehicle. They hold pockets of rich, creamy cheesiness better than traditional elbow macaroni. H: How can you possibly top this dish in next year’s competition? Are you feeling the pressure? K&A: We’ve already begun testing recipes. 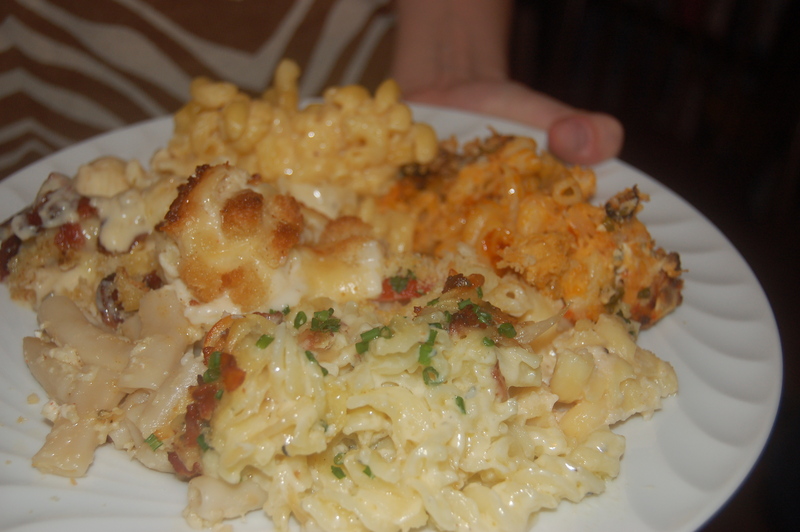 Adapted from Martha Stewart’s recipe for “Perfect Macaroni and Cheese,” spiced up by Kate and Alden Woodrow. Heat the oven to 375 degrees. Butter a 3-quart casserole dish; set aside. In a medium saucepan set over medium heat, heat milk. Melt 6 tablespoons butter in a high-sided skillet over medium heat. When butter bubbles, add flour. Cook, stirring, 1 minute. In stages, pour hot milk into flour-butter mixture while whisking. Continue cooking, whisking constantly, until the mixture bubbles and becomes thick. When you think you’ve cooked and stirred enough, cook and stir a little more until the sauce coats the back of a wooden spoon. Remove the pan from the heat. Stir in salt and all spices, 3 cups cheddar, 1 1/2 cups Gruyere, and duck fat (or bacon grease). Set cheese sauce aside. Cook pasta 2 to 3 fewer minutes than manufacturer’s directions until outside of pasta is cooked and inside is underdone. Strain, rinse under cold running water, and drain well. Stir pasta into the reserved cheese sauce. Dice jalapenos and add to pasta, along with a healthy dose of the juice from the can. Add a lot if you like it spicy like we do! Pour the mixture into the prepared casserole dish. Sprinkle remaining 1 1/2 cups cheddar and 1/2 cup Gruyere; scatter breadcrumbs and bacon over the top. Bake until browned on top, about 30 minutes. Transfer dish to a wire rack to cool for 5 minutes; serve.